Big M Janitorial Service has been employed at this enterprise for a period of more than a year. Based on this time frame, Big M Janitorial has done an excellent job for us. We can highly recommend Big M Janitorial for any company considering hiring a full service Janitorial Company. The Operations Manager from Big "M" is very communicative with us, and personally comes out to our site periodically to make sure we are satisfied with the work being done. He also is very easy to get a hold of in the event that we have any questions or need extra work done in our building. Big "M"'s employees are very courteous and professional, and do a very nice job of maintaining the buildings. Big “M” Janitorial and floor maintenance has been under contract with this Company since February 7, 2001. Big M’s service is more than satisfactory and is very diligent to detail. Our building is approximately 60,000 square feet, with very little carpeting. 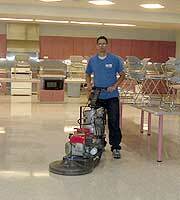 The floors reflect a shine and cleanliness that draws praise from any visitors to our center. The Operations Manager from Big “M” calls me frequently to ask if I am happy with his work. My answer has always been positive. I highly recommend Big “M” Janitorial and Floor Maintenance. We at Carustar, have had Big "M" janitorial do our weekly cleaning for four years. I find that the Operations Manager and his crew are trustworthy, dependable and very efficient. I know that anyone who hires Big "M" to do janitorial work will be as happy as we are with the service. The crew is very friendly and they go the extra mile to make everyone happy. The Operations Manager is just great, he is always there if you need him. If you need any more information please feel free to call.